Bitmap graphics: If graphics are to be displayed on the Web, they must be of a bitmap file in order to work properly. A bitmap is made up of rows and columns of dots, representing a graphic image in the memory of the computer. One or more bits of data represent the value of each dot, regardless if it is filled in or blank. 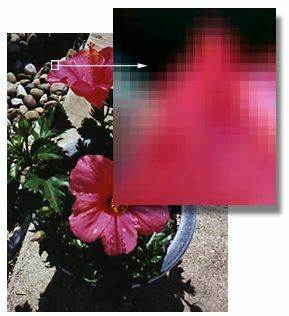 To display a bitmap image on a computer monitor, the computer forms the bitmap into "pixels" (short for picture element), which are the smallest unit of a digital picture. To output the bitmap for printing, the computer converts the bitmap into ink dots. In its simplest form, a bitmap image, also known as a raster image, contains only two colors, black and white. The number of colors can be increased until a near photographic quality is achieved. Bitmap images are compatible with most operating systems. Some of the bitmap formats are, GIF, Animated GIF, JPEG, PNG, DjVu, and MrSID. An example of a bitmap image is shown below. area of the bitmap image. Vector graphics: Also known as object oriented images, vector graphics are represented by mathematical formulas that define all of the characteristics of an image, such as curves, shapes, and lines, and are known as vectors. The mathematical formulas are automatically calculated as you create graphics using the various vector graphics software programs. Vector graphics can be resized easily without any distortion because the same mathematical formulas that created the original image are utilized to produce a larger or smaller version of the image. A common vector format is EPS (Encapsulated PostScript). Vector graphics are not appropriate for images that have subtle gradations of color or fuzzy edges, but are a good choice for small type and graphics that must have sharp lines when the graphic is resized, such as company logos, schematic drawings, and maps. One drawback is that these types of images created as a vector graphic cannot be viewed properly on the Web, just as they are. They must be converted into bitmap images for proper viewing on the Web, because current Web browsers do not have built in support for vector graphics. This may not be true for long, because a new format has been introduced that will change that. Scalable Vector Graphics (SVG), has been through more than half a dozen working drafts in order to get it perfected. It allows vector graphics to be displayed on the Web with a SVG viewer plug-in for browsers. SVG integrates with HTML and the file sizes are smaller than bitmap files. You are able to zoom in on a Web page to any magnification without any loss in resolution and all of the elements will remain sharp. Web pages can be made more functional and interactive than a with similar bitmap page. Another type of digital image, the metafile, can be either a bitmap or vector graphic. The metafile stores a full bitmap and a full vector of the image. When a metafile is left alone, the bitmap is utilized for imaging, but if it is resized, then the vector image is used. WMF is the predominant Windows metafile format and is used in conjunction with the clipart found in many of their programs. These clipart images are often resized by the user, in which case they would be a vector graphic. If they are left in their original form, then they can be used on the Web as a bitmap image.